^ "Algonquian, Algic". Ethnologue. Retrieved 28 April 2016. ^ "Shawnee". Ethnologue. Retrieved 28 April 2016. ^ Clark, Jerry. "Shawnees". Tennessee Encyclopedia of Culture and History. Retrieved 2008-09-11. ^ a b c Kleber, John E. (18 May 1992). The Kentucky Encyclopedia. University Press of Kentucky. p. 815. ISBN 978-0-8131-2883-2. Retrieved 17 February 2013. ^ McWilliams, Richebourg; Iberville, Pierre (1991-02-28). Iberville's Gulf Journals. University of Alabama Press. p. 175. ISBN 9780817305390. 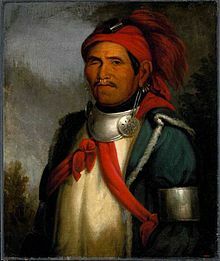 ^ Sherman, William Tecumseh. "H.B. Cushman, History of the Choctaw, Chickasaw and Natchez Indians (Greenville, Texas: 1899), 310 ff., quoted in "Survival Strategies"". Digital History. University of Houston. Retrieved 28 April 2016. ^ Koenig, Alexa; Stein, Jonathan. "Federalism and the State Recognition of Native American Tribes: A Survey of State-Recognized Tribes and State Recognition Processes Across the United States". Santa Clara Law Review Volume 48 (forthcoming). pp. Section 12. Ohio. Retrieved 2007-09-30. Ohio recognizes one state tribe, the United Remnant Band. . . . Ohio does not have a detailed scheme for regulating tribal-state relations. ^ "Early History". The Piqua Shawnee Tribe of Alabama. Retrieved 2013-02-17. ^ "State Recognized Tribes". National Conference of State Legislatures. Retrieved 14 July 2018. ^ "SHAWNEE TODAY". Big Bear's Den. 2012. Retrieved 2013-02-17. ^ Catherine Morris (2007-10-09). "Local Native Americans Host Cultural Dinner". Cincinnati.com. Cincinnati. Retrieved 2013-02-17. ^ "Shawnee Nation United Remnant Band". Retrieved 2013-02-17. 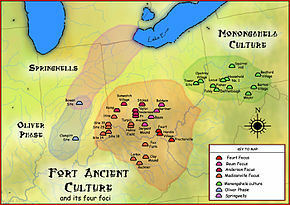 ^ a b c "Ohio Indian Tribes". AAANativeArts.com. Retrieved 2013-02-17. ^ "Lower Eastern Ohio Mekoce Shawnee in Wilmington, Ohio (OH)". faqs.org, Tax-Exempt Organizations. 2013. Retrieved 2013-02-17. ^ "The Inter Tribal Learning Circle". Fort Ancient. Archived from the original on 2013-08-01. Retrieved 2013-02-17. ^ "Platform Reservation Remnant Band". Retrieved 2013-02-17. ^ "Platform Reservation Remnant Band Church Of The Shawnee Inc. - Indiana Company Profile". Bizapedia. 2012-04-26. Retrieved 2013-02-17. ^ Patricia Lowry (2006-06-26). "Places: Near Fort Necessity, a National Road inn is reclaiming 1830s interior". Pittsburgh Post-Gazette. Retrieved 2013-02-17. ^ Paul Johnson (2008-01-22). "Native American Tribe Works Toward National Recognition". TheLedger.com. Retrieved 2013-02-17. ^ "Shawnee Nation - Ohio Blue Creek Band, Inc. - Ohio Company Profile". Bizapedia. 2011-11-28. Retrieved 2013-02-17. ^ "Re: [NA-SHAWNEE] the Indiana Blue Creek Shawnee roll". RootsWeb: NA-SHAWNEE-L. Retrieved 2013-02-17. There was no Blue Creek Band in Indiana...that's our Band here indigenous to Ohio...documented as late as 1870. You are looking for the Blue River Band.